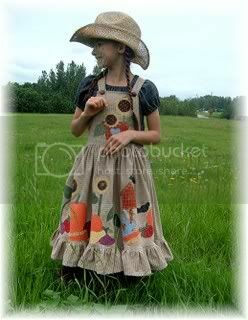 Laurie asked about the construction of the Harvest Dress in my sidebar. 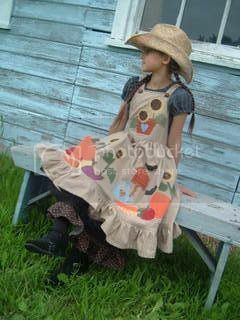 I made this dress a couple of years ago for a invitational event on Ebay featuring two children's designers from each state. 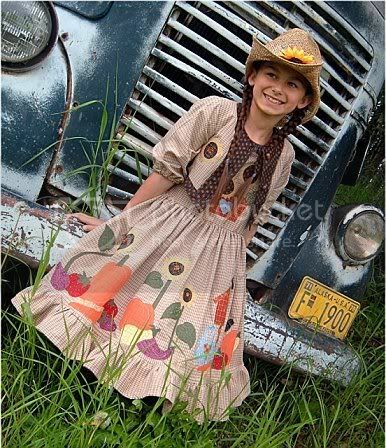 We were to design a children's garment thematic to our state. My design was inspired by the world-renown giant vegetables (due to our long summer sun and the unique glacial silt soil) in the Alaskan valley where I live. Jumper - An out-of-print Vogue children's pattern, 9275 Florence Eiseman. I wanted a really full skirt so I angled the side seams on the pieces even more and I added more fullness to the width. The appliques were done by fusing with Heat and Bond and then were "thread painted" (stitching to within a few threads of raw edges and then design lines stitched in) with rayon threads and then some selective beading done. 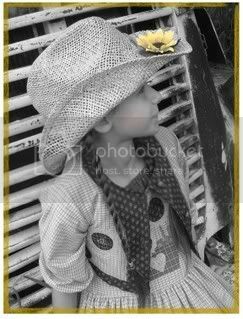 Edges were left raw to go along with the country primitive look of the outfit. Attached Petticoat - The skirt was going to be heavy from the weight of all the applique and its beading. I wanted the skirt to stick out so I added an attached petticoat. To avoid even more bulk at the waistline, I made a straight skirt from lining fabric that was the same waist circumference as the jumper bodice. I put the ruffle with a layer of gathered tulle at the bottom. It's about a 10 inch ruffle so that it can really hold the skirt out, but only peeks out a couple of inches. Jacket - I wanted a cropped jacket. 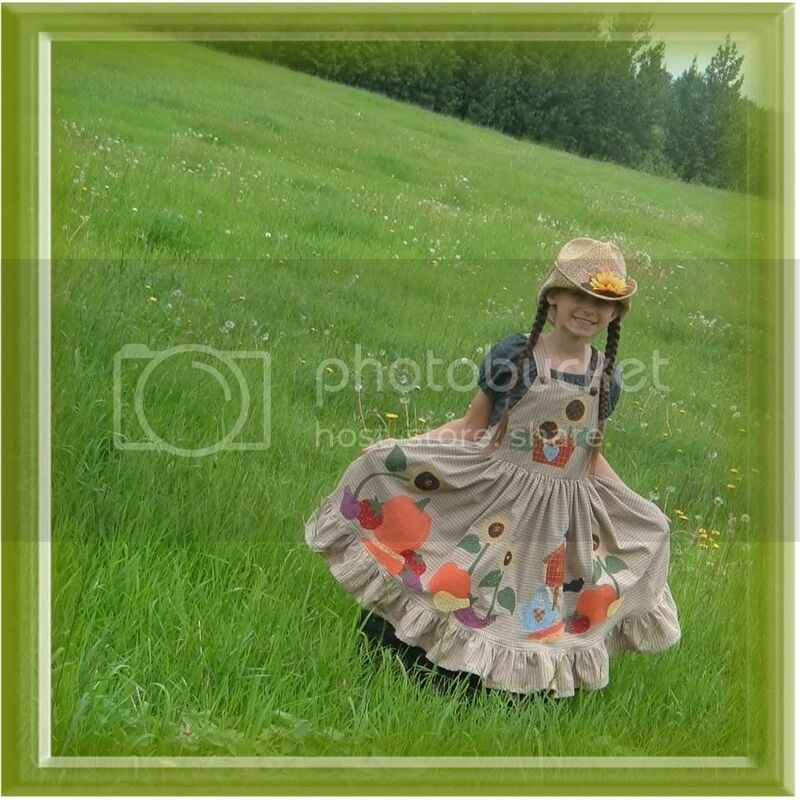 I took a girl's jewel neck, button to waist dress pattern. I no longer even recall what it was. Sorry. I only used the sleeve and bodice pieces. I cropped the length and the sleeves. I reversed the facings and did them in a contrast fabric. Jacket is lined. Hope that helps. Here are some additional pics. Did you take these photos? They (and the dress) are really great. Thanks for your comments on my blog the other day. It is a relief to know that there is so much support for stay-at-home mothering! I love this dress. It is wonderful! Hi Lindsay - Yes, I took the photos myself. 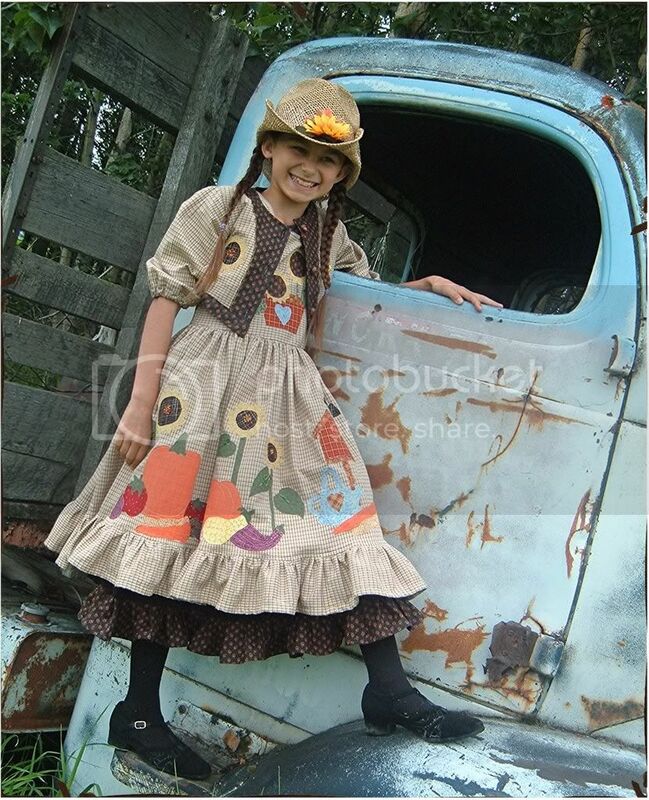 They were taken at one of the original homesteads in our valley owned by the grandparents of my little model (who attends my church). It was the perfect setting for the style of that garment. The homestead had so many interesting places and backdrops for photo-taking. I was thrilled with the pics. Andrea - You're welcome! And I wish you the best in your transition. I don't think you'll regret it! Thank you so much!! I absolutely think it is stunning and wonderful. Do you mind if I attempt to do a similar version for my girls? Where in Alaska do you live? I lived in Chugiak for a while with my Dad when I was younger -- he lived there most of my life. Laurie - Go right ahead. :) I'm making one like it for my model. I promised her one and that was a couple of years ago. :( I live in the Mat-Su Valley, about 30 minutes north of Chugiak.